This entry was posted in Daily Pearls of Virtual Wisdom, Social Issues and tagged Akhenaton, Ambrose Bierce, Anonymous, Death, Etty Hilsum, Friedrich Nietzsche, John Dryden, John Locke, Lazarus Long, Life, Little Feat, NSA, Philosophy, Poetry, Reality, Religion, Robert Heinlein, Roger von Och, Smart Bee, Society, Solomon Short, T.S. Eliot, The Bhagavad Gita, The Devil's Dictionary, The Upanishads, Walt Whitman, You Tube, Zohar by gigoid. Bookmark the permalink. Morning…..great choice yet again…..Death…”no one gets out alive” or “Death is just the beginning”….or well you get the point….I prefer to worry about something I can try to correct…..I have faced it 3 times in my life so one more is no big deal…..
BTW, my fave Christian has returned yet again……read the comments…. Glad you enjoyed today’s mess, my brother…. I did see those comments, & left one of my own there…. Bozos often don’t know their noses have grown…. Live long and prosper, yourself, amigo… Spock is never out of place…. No worries; some days, I’m quicker than others…. Now listen chuq…you should be more Christian like…shame on you…may you burn in hell! Your writing reminds me ……..? keep up with your work….it is good. 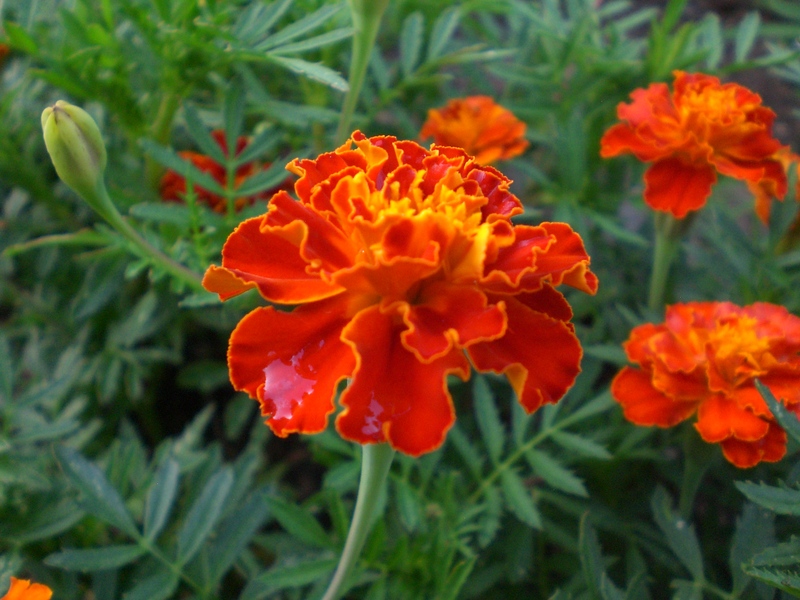 Wot a wonderful gift…….my fave colour……marigolds and the smell ! 🙂 I remember someone telling me long ago marigolds helps to keep the bugs away? And. that is the sum total of my gardening knowledge, what with my black thumb… I’ve killed cactus…. The aphids, I see. So you’re a cactus killer, eh? Well, nasturtiums are pretty peppery when chewed…. pretty, and edible, but, a bit much for my taste in salads…. As for male bugs, I’d suggest eau de perspiration…. Me, I like it, but, most males are fastidious creatures at base…. The natural juice of the orange peel is supposed to kill termites; maybe it would work?…. We can only hope…. but, sounds good to me…. Having posted a fresh Pearl yesterday, the newly current structure of Time I inhabit kept me busy enough to prevent the same today. I am still on call for babysitting duty, but, that shouldn’t keep me from working on one during the slack time…. but, even that is complicated by the attraction of three new books I received as Xmas gifts, all of which have already grabbed a piece of my attention. However, I did find this Pearl from 2016, with a rather fine rant/discussion of Life and Death from 2013. All in all it’s a pretty damn good one, so, I hope you enjoy the sublimation. I’ll be back with more fresh stuff in a day or two…. In the meantime, y’all be well, & happy as you may be, while I do my best to do the same. Stay strange, ffolkes….